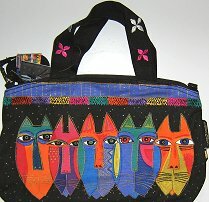 Five distinctive tribal cats are featured on this small purse or handbag. The cat purse features 1 inside zippered pocket, the signature Laurel Burch zippered closure and embroidered handles. A detachable shoulder strap in included. The tote is 14" wide x 8 1/2" high x 3" deep.